In this tutorial you will learn about Introduction to Oracle Reports Builder, Report file storage formats, Oracle Reports Builder Tools, Report Wizard, Triggers in Reports, Types of Triggers and Case Study – Creating a Tabular report. Queries are SQL Select statements that fetch data from the oracle database. These statements are fired each time the report is run. Data columns contain the data values for a report. Default data columns, corresponding to the table columns included in each query’s SELECT list are automatically created by oracle reports. Each column is placed in the group associated with the query that selected the column. Formulas can be entered in formula columns to create computed columns. Formulas can be written using PL/SQL syntax. Formula columns are generally preceded by CF_ to distinguish from other columns. Summary columns are used for calculating summary information like sum, average etc. This column uses a set of predefined oracle aggregate functions. Summary columns are generally preceded by CS_ to distinguish them from other columns. • Query Type Choose whether to build a SQL query or an Express query. • Displayed Fields Select the fields that you want to display in the output. • Fields to Total Select the fields that you want to summarize. • Labels for Fields Alter the labels that appear for each field and the width of each field. • Template Select the template that you want to use for this report. A template contains standard information such as company logo, date, and so on. Note: The above steps are different for each report style. The difference between Mailing Labels and Form Letters is, Mailing Label shows multiple records on one page while Form Letter shows one record on each page. Formula Triggers: Formula triggers are PL/SQL functions that populate columns of type Formula. Format Triggers: Format triggers are PL/SQL functions executed before the object is formatted. These triggers are used to dynamically change the formatting attributes and used to conditionally print and not to print a report column value. These triggers return Boolean values TRUE or FALSE. If the return value of the format trigger is FALSE, the value is not displayed. Action Triggers: Action triggers are used to perform user-defined action. These triggers do not return any value. Validation Triggers: Validation triggers are PL/SQL functions that are executed when a parameter value is entered and the cursor moves to the next parameter. These triggers return Boolean value TRUE / FALSE. Report Triggers: Report triggers enable execution of PL/SQL functions at specific time during execution and formatting of report. Fires before the Runtime Parameter Form are displayed. Can access the PL/SQL global variables, report level columns and manipulate accordingly. Fires after the Runtime Parameter form are displayed. Used to validate the parameter values. Fires before the report is executed but after the queries is parsed and date is fetched. Fires before each page of the report are formatted, except the very first page. 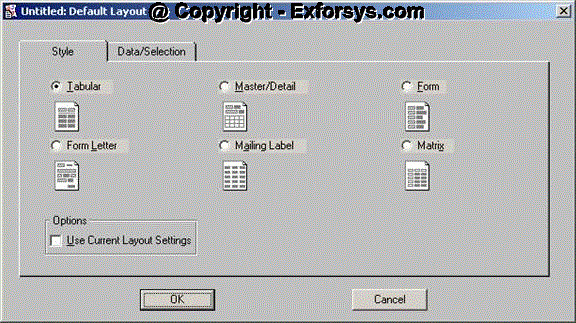 This page is used to customize page formatting. Fires after the report previewer are exited, or after report output is sent to a specified destination. After invoking the report builder and connecting to the database invoke Report wizard. Click on Tools… Report Wizard… to start the report wizard for a new report. Report wizard shows the following tab pages to enter information required for report. The Data tab allows creation of an SQL statement using Query Builder or to enter the SQL statement in the multi line edit box provided in the Data tab. This will take you to the next tab if your SQL statement syntax is correct. Fields tab is used to specify the fields that must be displayed in tabular format. Select all fields by clicking on >> icon. 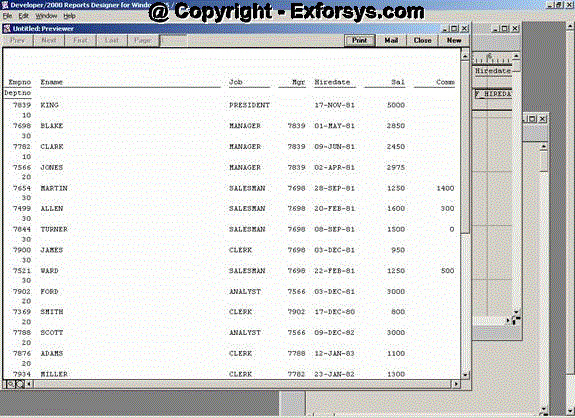 The Totals tab is displayed that allows creation of Summary columns using aggregate functions. This report does not include totals for the selected fields and thus Click Next. The Labels tab is displayed that enable us to change the labels of the columns. The Templates tab is displayed that enable us to create report from templates. There are number of pre-determined templates available in Oracle Reports Builder. Click on File. Save to save the report, specify the report name and click OK.